[Optimized for Laptop Carrying]: The high-quality multi-directional metal mesh provides your laptop with a wear-resisting and stable laptop carrying surface. If you’ve ever been browsing the internet with your laptop on your lap, you might have noticed that the bottom starts to become hot to the touch after a while. As computers become smaller to meet our mobile demands, we’re seeing a trend in overheating due to the close proximity of a laptop’s hardware components. Although most laptops have fans built in, sometimes a little extra cooling is necessary for your computer to perform optimally. Using a reliable cooling pad can keep your laptop from overheating and potentially crashing. 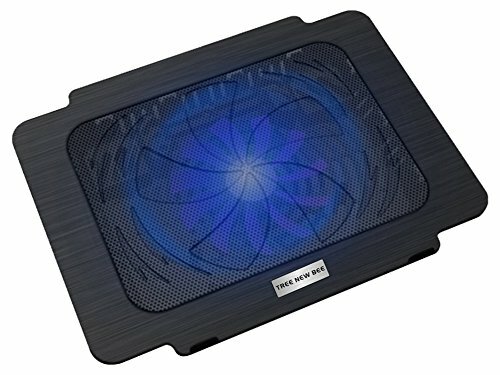 Havit’s HV-F2056 cooling pad offers superior cooling and ergonomic comfort all in a sleek, high-tech design. Users found that they were able to run even sophisticated programs and games without their laptops overheating. The bright blue LED lights provide a glow from beneath even with a laptop placed on top. A metal mesh finish creates a grippy surface that will hold your laptop in place even when tilted, so it’s optimized for safe laptop carrying. Constructed of solid, high-quality metal, users said that this cooling pad held up after long-term use and did not deform under the weight of their laptops. Cheaper plastic models often become weak over time and tend to bow in with frequent use, but this material remained rigid and sturdy. Three large fans allow for maximum airflow and cooling while you work or play. Each fan is 110mm and spin at over 1,000 RPM for 65 cubic feet per minute (CFM) of air flow. This provides sufficient cooling for laptops that are running even the most demanding programs for long periods of time. Havit’s cooling pad measures at about 17 inches, making this a great option for users with larger laptops. Some users reported that they use it with laptops up to 21 inches with positive results. Despite it being a large cooling pad, it is remarkably light and portable. At just over 1 inch thickness and 1.6 pounds, it’s lightweight enough for regular travel so you can protect your laptop wherever you go. One of the most common complaints about laptop cooling pads is their noise level. Havit has managed to create superior cooling in an exceptionally quiet package with their HV-F2056 model. Users were astounded by its smooth, quiet operation. One user even said it runs so quietly that he has to periodically check to make sure the fans are still running. 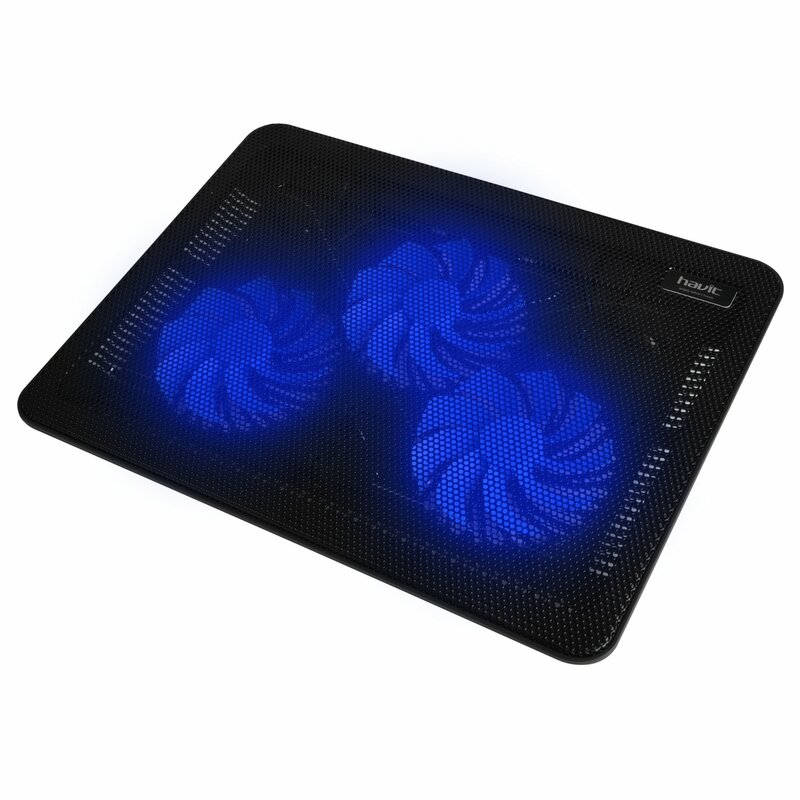 An ergonomic design and 2 adjustable height settings make this cooling pad comfortable and easy to use. Whether you prefer to use your laptop on your desk or from the comfort of your bed or couch, this Havit cooling pad is comfortable to use for long periods of time. To put your laptop at a slight incline, simply flip out the padded flip-feet on the bottom of the pad and enjoy comfortable typing all day. Beside the power switch are two USB ports so you can plug in additional devices while you surf the web. This is especially helpful if your laptop has limited USB ports. Plug in speakers, a wireless mouse, or a separate keyboard without taking up valuable USB space. 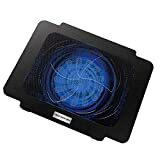 Although it retails for $39.99, this cooling pad can be purchased on Amazon for only $19.55. At this discounted price, the Havit HV-F2056 is a top performer at one of the best values on the market today. Casual laptop users and serious gamers alike enjoyed the cooling features and sophisticated design. Havit backs this product with a 30 day money-back guarantee and 1-year manufacturer warranty to cover defects in manufacturing. They also offer free lifetime technical support. Out of over 2,600 reviews on Amazon, 88% came in at 4 stars or higher to earn this product an overall 4.5 stars. It also received a #1 rating on Top 10 Best Pro and a #4 rating on Top Ten Reviews. Its superior performance and lightweight design have made it a consumer favorite and earned it the top spot on our list as Gold Pick. Tree New Bee’s K0025 model is a uniquely designed laptop cooler with 4 high performing fans for optimum cooling. Similarly to the Havit cooling pad, this product is made with a metal mesh anti-skid surface to keep your laptop in place. The durable metal is resistant to deformation under the weight of even heavy laptops. Four large 110mm fans offer superior cooling to your laptop even while running demanding programs. The fan speeds are adjustable, offering 1200 +/- 10% RPM to suit your specific needs. Two dials on the side of the pad allow you to adjust the speeds of two fans at a time. The slim, lightweight design of this cooling pad make it an excellent option for those who travel often or who just want something light and easy to carry. Weighing in at just 1.8 pounds and with a thickness of 1.5 inches, this is another portable model designed for easy carrying and packing. Although the fans aren’t particularly loud, users said they’re not exactly quiet, either. They produce a mid-level humming sound, which some found annoying but others didn’t mind. A few users reported that one fan became louder than the others, which may point to a manufacturing defect and may be covered by the manufacturer’s warranty. For comfortable use even during long stretches of use, two small kickstands can be extended from the bottom of the cooling pad to set your laptop at a slight incline. This ergonomic design is especially convenient for those who use their laptops at a desk for long stretches of time. Like the Havit model, this cooling pad has two USB ports to allow you to plug in extra devices as needed. These ports are located on the back of the cooling pad near the fan adjustment dials. However, one of the ports must be used to plug the cooling pad into the laptop for a power source, leaving you with only one extra USB port. At only $19.99 MSRP, the Tree New Bee K0025 is reasonably priced for somebody who needs a portable, lightweight option. The unique eye-catching design was enjoyed by a number of users. 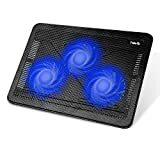 89% of reviewers on Amazon gave this laptop cooling pad a rating of 4 stars or higher for an overall rating of 4.5 out of 5 stars. The critical reviews mostly referenced the noise of the fans and incidences of one or more fans becoming excessively loud or failing to work. However, the reviews were overall positive, with users saying they would recommend this cooling pad to gamers and other laptop users with overheating problems. 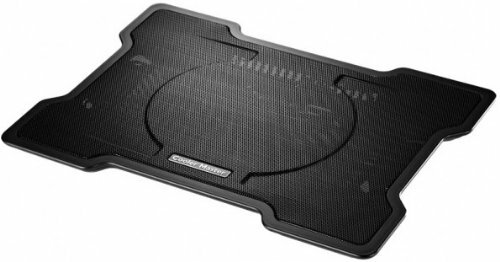 Cooler Master’s NotePal cooling pad was designed specifically with gamers in mind. To create a portable, convenient cooling pad, Cooler Master placed one extra-large fan in an extra slim but durable package. A mesh metal top panel allows air to flow through while creating an anti-slide surface for your laptop. Users report that the top panel is durable and stood the test of time even with consistent use, resisting deformation and bowing. Unlike the previous cooling pads, the Cooler Master model features just one extra-large fan. At 160mm, the fan spins at approximately 1500 RPM and is capable of generating up to 70 CFM for maximum cooling power. Although the fan’s speed is not adjustable, users found that its standard speed was sufficient for cooling their laptops without generating excess noise. For the ultimate in convenience and portability, Cooler Master has created their “X-Slim” series. The lightweight, slim construction is ideal for those who travel often or who just prefer something less bulky than traditional laptop coolers. At its highest setting, it stands only 46mm and weighs just 1.5 pounds. It measures 14 inches and is best suited to laptops of 15 inches or less. If you’re looking for low-profile portability, this is it. Reviewers consistently reported that this fan was one of the most quiet they had ever used. No annoying whirring or humming was reported. Two foldout feet allow for you to adjust the incline of your laptop while you’re working. However, because it only reaches 46mm at its highest setting, the adjustment is less noticeable than it is in comparable models. This comes down to preference, as some users enjoyed the more subtle incline while others wished they could increase it. An extra USB port allows you to connect peripheral devices for charging or to use with your laptop. The cooling pad is USB-powered with a cable that is conveniently attached to a pass-through on the bottom of the machine so you don’t lose a USB port. Integrated cable grooves on the bottom of the pad allow for easy cable management. The Cooler Master NotePal can be purchased on Amazon for just $14.83. For its price and performance, this is one of the best values on the market today, especially for those who are looking specifically for portability. With over 9,300 reviews, it’s clear that this cooler has been a popular choice for many gamers and laptop users. It comes in at 4.1 out of 5 stars overall, with 76% of reviewers rating it 4 stars or higher. Another cooling pad from Tree New Bee, the K16 is a somewhat smaller model than most of their other coolers. Its compact size doesn’t take away from its cooling power – most users said that this small but powerful model was sufficient to keep their laptops cool. When the top panel is open, the fan itself is bright blue, and blue LED lights illuminate the device. The top panel is made of metal mesh for maximum airflow and an anti-slide surface. Despite being made of metal, several users said that the top panel did bend somewhat after repeated long-term use with large laptops. However, this shouldn’t be an issue with the smaller laptops for which it is specifically designed. A single 140mm fan spins at 1000 RPM to produce enough air flow to effectively cool a laptop up to 15 inches. 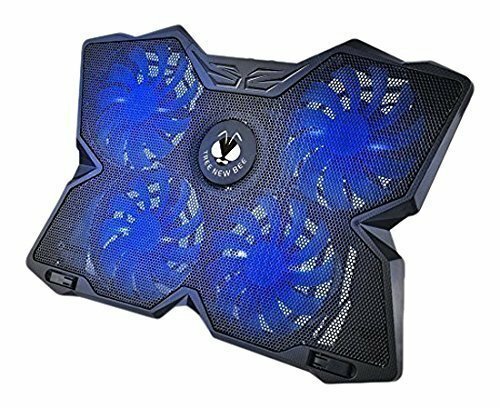 Some users who use their laptops for heavy-duty gaming said that they still noticed their devices becoming hot after some time, and would recommend this for more casual users and day-to-day use. At 13 inches in length and weighing in at only 12 ounces, this is the most compact cooler on our list. This makes it ideal for use with small laptops, notebooks, and tablets. For the frequent traveler, this portability is a major convenience. Most users were very impressed with the quietness of the large fan. For the most part, reviewers said that you couldn’t hear the fan at all. Many less expensive models tend to be noisy, but Tree New Bee managed to create a virtually silent model in their K16. Similarly to the previous coolers, this pad features fold-out feet that can be unfolded to increase the angle of the cooler. This makes it more comfortable for use at a desk by angling the keyboard and tilting the screen toward you. This model is powered by a USB cable that attaches to your laptop. The cable is 20 inches to reach most of the existing ports on your laptop. However, there is no additional USB port to plug in extra devices. For easy maintenance and cleaning, this model features an opening top panel to allow you to access the fan directly. This is an advantage over the fixed-screen models, which can tend to gather dust over time. Although it retails for $39.99, the K16 is deeply discounted on Amazon for an impressive $9.99, earning it a spot as our Best Budget Pick. User reviews were consistently positive, with an overall rating of 4.6 out of 5 stars on Amazon. Impressively, no 1 star reviews were recorded. The critical reviews were predominantly left by serious gamers whose laptops required more cooling than this model could provide. For a casual gamer or the average laptop user, the cooling provided by this model was more than sufficient. The single most important feature of a laptop cooling pad is its ability to effectively cool your laptop. The right cooling pad can keep your laptop up to 5-10 degrees cooler. The number of fans isn’t necessarily the deciding factor here – a pad with only one powerful fan will be more effective than one with four weak fans. Look for a cooler that produces enough air flow for your needs. Air flow is typically measured in CFM – cubic feet per minute. Depending on what you plan to use your laptop for, you may need more or less CFM to keep it cool. Low-end models can hover around 20 CFM while high-end ones can reach upwards of 70 CFM. Typically, as power increases, so does price. For the serious gamer or computer programmer, the higher price point might be worth the increased performance. Before deciding on a laptop cooling pad, determine where you’ll be using it most often. If you primarily use it in a fixed location and don’t require a lot of portability, you may be better off with a slightly heavier-duty model. Coolers that are heavier tend to have slightly higher performance than coolers that are designed specifically with portability in mind. While lighter models can sometimes compromise some functionality and performance, the extra portability can outweigh any drawbacks if you are a frequent traveler. A bulky design will make storing and packing your laptop cooler inconvenient, so opt for something that is streamlined and simple. A fan that hums and whirs can be irritating and distracting for you and those around you. Whether your laptop cooler of choice has one fan or multiple fans, choose something that has a reputation for being reasonably quiet. The ability to adjust the height of your cooler will allow you to work comfortably at a desk. By orienting the keyboard and screen toward you at an angle, you reduce strain on your wrists and eyes. If you tend to use your laptop on the couch or in bed, you’ll want to choose a model that is comfortable to hold on your lap for long periods of time. Some laptop cooling pads have extra USB ports for conveniently plugging in additional devices. If you’re always running out of USB port space on your laptop, this may be an additional feature worth investing in. Keep in mind that most cooling pads are USB powered and must be connected to your laptop for power, so coolers that appear to have two ports may only have one extra port available as the other will be taken up by the power cord. Havit’s HV-F2056 combines the best of performance, comfort, and portability in one sleekly designed package. Casual users and serious gamers alike said that their laptops were able to stay cool even while using the most demanding software for long stretches of time. Its discounted price on Amazon makes this one of the best values among laptop coolers of its class. Top consumer ratings from individuals and technical review sites alike have earned this the top spot on our list as Gold Pick.